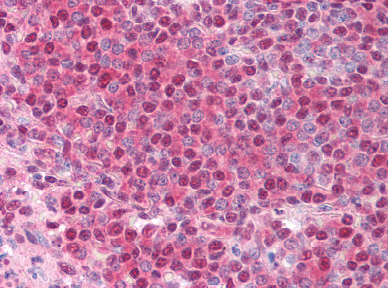 The mitotic checkpoint protein Bub3 is involved with the essential spindle checkpoint pathway which operates during early embryogenesis. Bub3 is important during G2 and early mitosis stages, permitting entry into mitosis depending upon the assembly state of microtubules, thus preventing premature sister chromatid separation, mis-segregation and aneuploidy. Bub3 contains four WD repeat domains and is required for the kinetochore localization of Bub1, a related kinase that is necessary for spindle assembly checkpoint function. Bub1 is able to autophosphorylate and can catalyze the phosphorylation of Bub3. 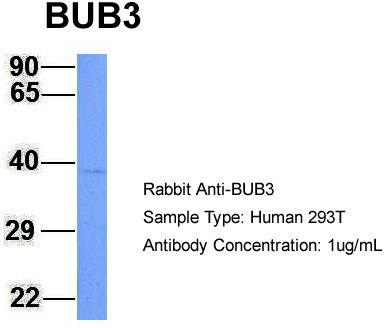 Both Bub1 and Bub3 are mutually dependent for function. Altered Bub expression levels may significantly impair mitotic checkpoint function and is associated with tumor cell proliferation. Immunocytochemistry of BUB3 in Jurkat cells with BUB3 polyclonal antibody ( Cat # PAB12997 ) at 10 µg/ml. 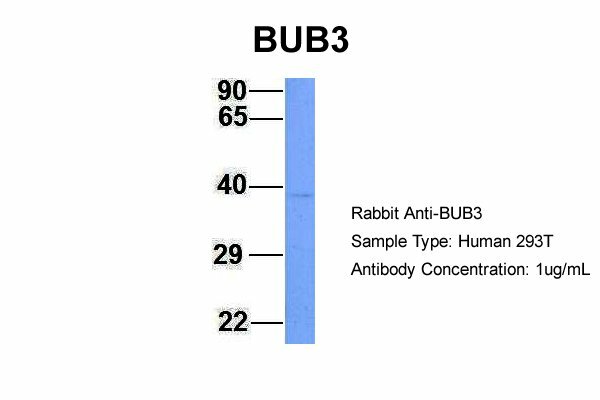 Western blot analysis of BUB3 in Jurkat cell lysate with BUB3 polyclonal antibody ( Cat # PAB12997 ) at ( A ) 0.5 and ( B ) 1 µg/ml. 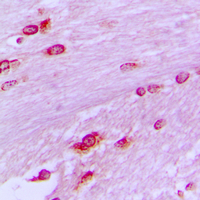 Immunohistochemistry analysis of Bub3 antibody (Cat.-No AP20475PU-N) in paraffin-embedded human brain tissue. 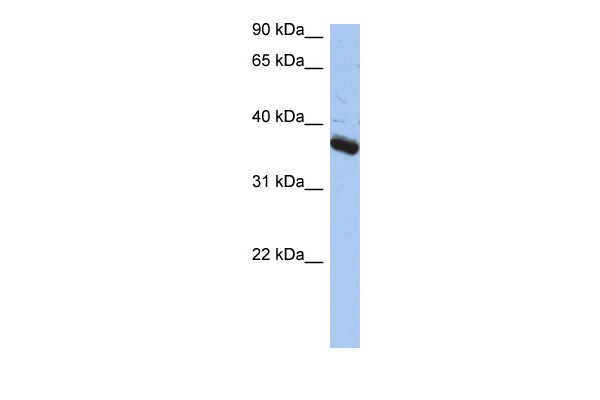 Western blot analysis of Bub3 antibody (Cat.-No AP20475PU-N) at 1/500 dilution: Lane 1: Hela cell lysate. Lane 2: Raw264.7 cell lysate. Lane 3: H9C2 cell lysate. 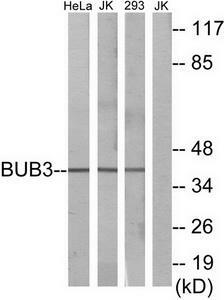 Western blot analysis of Bub3 antibody (Cat.-No AP20475PU-N) in extracts from HeLa cells. 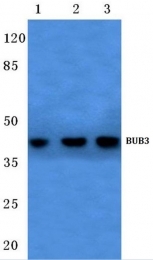 Western blot analysis of extracts from HeLa cells/Jurkat cells/293 cells, using BUB3 Antibody. The lane on the right is treated with the synthesized peptide. The cell lysates of HeLa(40ug) were resolved by SDS-PAGE, transferred to PVDF membrane and probed with anti-human BUB3 antibody (1:1000). Proteins were visualized using a goat anti-mouse secondary antibody conjugated to HRP and an ECL detection system. 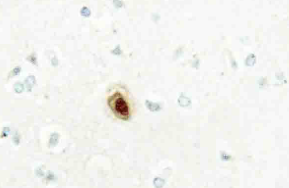 Immunohistochemical analysis of BUB3 staining in human brain formalin fixed paraffin embedded tissue section. The section was pre-treated using heat mediated antigen retrieval with sodium citrate buffer (pH 6.0). The section was then incubated with the antibody at room temperature and detected using an HRP conjugated compact polymer system. DAB was used as the chromogen. The section was then counterstained with haematoxylin and mounted with DPX. Immunofluorescent analysis of BUB3 staining in HeLa cells. Formalin-fixed cells were permeabilized with 0.1% Triton X-100 in TBS for 5-10 minutes and blocked with 3% BSA-PBS for 30 minutes at room temperature. Cells were probed with the primary antibody in 3% BSA-PBS and incubated overnight at 4 C in a humidified chamber. Cells were washed with PBST and incubated with a DyLight 594-conjugated secondary antibody (red) in PBS at room temperature in the dark. DAPI was used to stain the cell nuclei (blue). 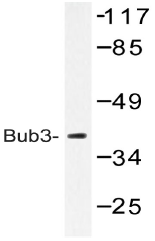 Western blot analysis of BUB3 expression in HeLa (A); HEK293T (B) whole cell lysates. 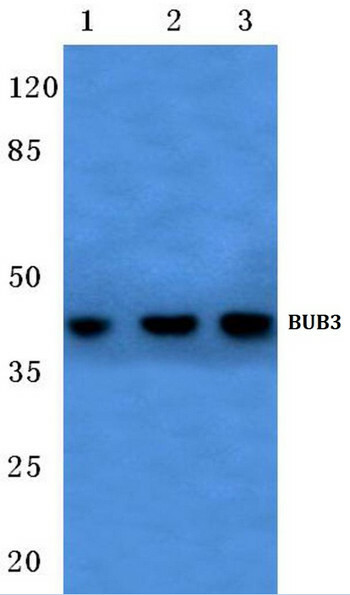 Western blot analysis of bub3 in Jurkat cell lysate with bub3 antibody at (A) 0.5 and (B) 1 ug/mL. 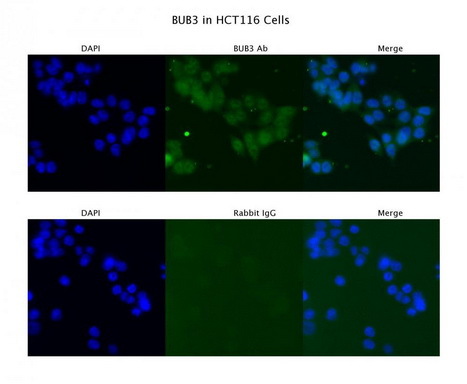 Immunocytochemistry of Bub3 in Jurkat cells with Bub3 antibody at 10 ug/mL. 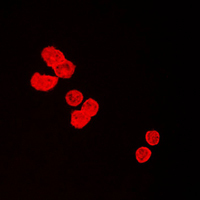 Immunofluorescence of bub3 in Jurkat cells with bub3 antibody at 20 ug/mL. Western blot analysis of extracts from HeLa cells, Jurkat cells and 293 cells, using BUB3 antibody.The lane on the right is treated with the synthesized peptide.